I try to give some additional information, so let's start with the Dropper. Note: All files of this malware have the extension ".com", but they are all .exe files (just renamed to .com). This file is a compiled AutoIt script, which by default is packed with UPX. After unpacking it, we can load the executable into an AutoIt decompiler (e.g. www.exe2aut.com) to see that this file just shows the picture "faktura_scan535624.jpg" (see above) and runs the file "aqq1.com" (see above). The picture shows a polish bill of sale from the product from the website fakturki.pl. It first checks if the passed days of the current year reached the number 100. If so, jqs.com with the first shellcode is started and then Symantec.com sleeps for a minute. Then a file named "jar_cache879799398409779005999.tmp" is searched in Temp folder and gets deleted if found. I don't know why this "Java file" is searched and deleted, but it is probably the file that gets downloaded or dropped from the downloaded file. Another possibility is that the malware is launched by a Java Applet or a Java exploit. If this Java file isn't found, jqs.com is started with the second shellcode. Then again it sleeps for a minute, searches for the same "Java file" and deletes it. There are two polish words as function names in the script ("uruchom" = "launch" and "sprzatanie" = "cleanup"). Together with the picture (see above), I think the malware's creator is from poland or polish speaking. This file was also packed with UPX. This file launches one of the above shellcodes within a new Thread to connect to server at 184.82.19.103. It does this by allocating a memory buffer (VirtualAlloc()) and storing the passed parameter (shellcode) into it. Then the pointer of the buffer is passed as lpParameter to the CreateThread() API function. 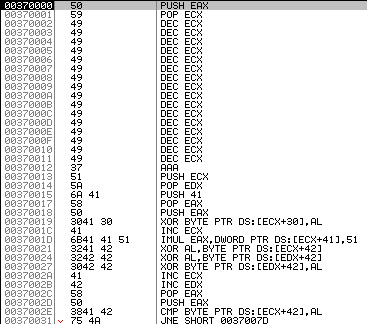 The new Thread uses the pointer to call the shellcode (call eax). The shell dynamically resolves some Windows API functions to call them afterwards. It requests data from the server (InternetReadFile()), to copy it into a buffer (VirtualAlloc()) and passing execution to it. As mentioned at the beginning, the server isn't responding, so it's not possible to get more information of the downloaded data (another file or shellcode).